Earlier this month, I had a chance to travel to the Middle East and to visit the International Fund for Animal Welfare office in Dubai in the United Arab Emirates. The Middle East is a transition point for the illegal wildlife trade, especially ivory and live animals. Many governments in the region are anxious to address the illegal wildlife trade and to improve animal welfare standards overall. Arab countries play an important role in institutions like CITES where their votes on matters such as ivory trade are critical. Formerly, few people dealt with these nations at CITES until IFAW started publishing materials in Arabic. This has been highly appreciated. According to Dr. Elsayed Mohamed, who runs our Middle East office, Islam explicitly places kindness to animals as an important value. From what he’s experienced, the idea of animal welfare is greatly accepted when based on Islamic principles. In just the last few months, we’ve launched awareness campaigns for the public and for young people, held training workshops for police and customs officials and collaborated with government agencies to promote animal welfare. In late December, we launched our “Think Twice” campaign at Dubai’s airport, which is one of the world’s busiest international airports. This campaign urged tourists not to buy wildlife souvenirs as many are made from endangered species. 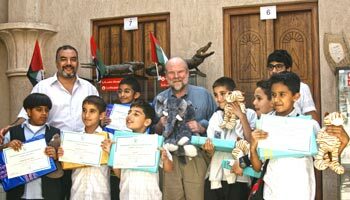 The week I was in Dubai, IFAW hosted an animal action open house for young people. The kids learned about our “Say No! to Ivory” campaign and the dangers of keeping wild animals as pets. If you want to make your voice heard against the ivory trade, sign our petition. Ownership of wild pets, such as lion and cheetah cubs and monkeys, is rising in the Middle East and the animals are often acquired for children. Children and parents are learning that keeping wild animals as pets is dangerous to their families, doesn’t give the animals the quality of life they deserve and contributes to extinction in the wild. Late last year, IFAW and the Emirate of Dubai’s Veterinary Services Section of the Department of Public Health Services hosted the country’s first animal welfare seminar for officials responsible for public safety and planning. About 45 participants from government ministries, agencies and offices, IFAW and K9 Friends, a local animal rescue organization, attended the seminar. The purpose of the seminar was to talk about ways to close the gap between legislation and commonly held attitudes about animal welfare, which are lagging behind laws to protect animals such as dogs and cats, horses and donkeys and wild animals such as birds and lions. Participants also stressed the importance of training vets and their assistants on the need to raise community awareness about cruelty to animals. In addition, we and the Ministry of Environment and Water in UAE signed a memorandum of understanding with the aim of promoting environmental education and conservation. Not long ago, with the support of the Abu Dhabi police, IFAW and the Emirates Dog Breeders Society organized the second Prevention of Wildlife Trafficking Training workshop in Abu Dhabi. The purpose of the five-day workshop was to train police officers and customs officials about how illegal wildlife enters the country, how to detect the techniques employed by smugglers to hide contraband, and to know what animals are commonly trafficked illegally. All these activities are getting our message across. There’s more work to do, but the way in which many people in this region have embraced the need for better animal welfare encourages me. Together, IFAW and the people of the Middle East can make real improvements in the lives of both animals and people in the region. Help us end the trade in ivory by saying NO! right now on our global petition.